David Koyzis (b. 1955 Oak Park, Illinois, USA) is Professor of Political Science at Redeemer University, Ancaster, Ontario, Canda. He is married to Dr. Nancy Calvert-Koyzis, they have one daughter. He studied under Bernie Zylstra for his MPhil at the Institute of Christian Studies, Toronto. 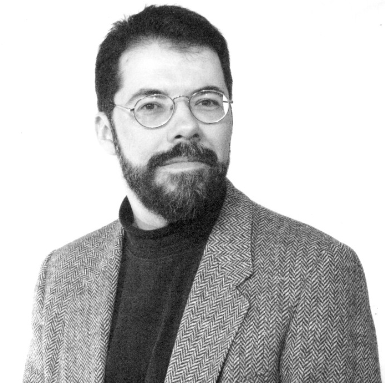 His PhD "Toward a Christian Democratic Pluralism: A Comparative Study of Neo-Thomist and Neo-Calvinist Political Theories,” was awarded by the University of Notre Dame in 1986 under the supervision of Dr. Edward A. Goerner. He earned his BA in political science from Bethel College (now Bethel University) in 1978. His personal interests include philosophy, history, antique maps and atlases,genealogy, music composition, art, liturgy, hymn-writing and psalm-versification. He blogs at Notes from a Byzantine-Rite Calvinist and First Things: Evangel. 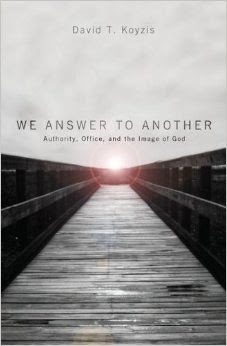 We Answer to Another: Authority, Office, and the Image of God is now available. The quest to escape authority has been a persistent feature of the modern world, animating liberals and Marxists, Westerners and non-Westerners alike. Yet what if it turns out that authority is intrinsic to humanity? What if authority is characteristic of everything we are and do as those created in God's image, even when we claim to be free of it? What if kings and commoners, teachers and students, employers and employees all possess authority? This received first place in the non-fiction/culture category from The Word Guild Canadian Writing Awards, 2004. Subject of Mars Hill Audio Journal interview, November-December 2004, "on the modern denial of objective meaning and the exaltation of individual will." “God’s Gracious Provision: Calvin and his heirs on political order,” in Amy Nelson Burnett, John Calvin: Myth and Reality (Eugene, Oregon: Cascade Books/Wipf & Stock, 2011), pp. 199-206. “The 'Oppressiveness' of Civil Society,” Comment, 20 August 2010. “Two Kingdoms and Cultural Obedience,” Comment, March 2010, print issue. “(Re)Discovering the Evangelical Mind,” Comment, 12 February 2010. “Religion and democracy: Habermas vs. Flores d'Arcais,” Comment, 26 June 2009. “Convergence or Clash? The Coming Global Future,” Michael Goheen and Erin Glanville, ed., The Gospel And Globalization: Exploring The Religious Roots Of A Globalized World (Vancouver: Regent Press and Geneva Society, 2009). “Preparing for Leadership,” Comment, 1 June 2007, republished at Christianity.ca. “Persuaded, Not Commanded: Neo-Calvinism, Dignitatis Humanae, and Religious Liberty,” in Kenneth Grasso and Robert Hunt, ed., Catholicism and Religious Freedom: Contemporary Reflections on Vatican II’s Declaration on Religious Liberty (Lanham, Maryland: Rowman & Littlefield, 2006). “Introductory Essay,” in Daniël F. M. Strauss, ed., Political Philosophy by Herman Dooyeweerd (Ancaster, Ontario and Lewiston, New York: The Dooyeweerd Centre and the Edwin Mellen Press, 2004), pp. 1-16, The Collected Works of Herman Dooyeweerd, series D, volume 1. “Christianity and Liberalism: Two Alternative Religious Approaches,” the New Pantagruel: Hymns in the Whorehouse, summer 2004, vol. 1, no. 3. “Making a Good Constitution Better: A Response to Janet Ajzenstat,” Comment (Work Research Foundation), winter 2004, pp. 15-21. “Differentiated Responsibility and the Challenge of Religious Diversity,” Journal of Markets & Morality, vol. 5, no. 1 (spring 2002), pp. 199-207. "Symposium: The Future of Federalism," Comment, July-August 2001, pp. 14-15. "Voter turnout and competitive politics," Public Justice Report, vol. 23, no. 3, 2000, p. 3. “Why Political Divorce Must Be Averted,” in Mark Charlton and Paul Barker, ed., Crosscurrents: Contemporary Political Issues, 3rd ed. (Toronto: ITP Nelson, 1998), pp. 211 ff. "Canadian Election Accentuates Divisions Once Again," Public Justice Report, July-August 1997, p. 2. "A Call to Reform the Canadian Electoral System," Public Justice Report, July-August 1997, p. 3. “Hannah Arendt on Polis, Nation-State and Federation,” in Jonathan Chaplin and Paul Marshall, ed., Political Theory and Christian Vision (Lanham, Maryland: University Press of America, 1994). “Reclaiming the Polis: the Anticosmopolitan Vision and the Quest for Genuine Political Community,” Dianoia: A Liberal Arts Interdisciplinary Journal, 3 (no. 2) and 4 (no. 1) 1994, pp. 83-100. “Imaging God and his Kingdom: Eastern Orthodoxy’s Iconic Political Ethic,” Review of Politics 55 (spring 1993), pp. 267-289. “Yves R. Simon’s Contribution to a Structural Political Pluralism,” in Michael D. Torre, ed., Freedom in the Modern World: Jacques Maritain, Yves R. Simon, Mortimer J. Adler, Notre Dame: American Maritain Association and University of Notre Dame Press, 1989, pp. 131-9. “Progress as an Object of Faith in the Thought of Friedrich A. Von Hayek,” Christian Scholar’s Review, 12 (no. 2) 1983, pp. 139-55. Also several book reviews in Christian Scholar's Review, Journal of Psychology and Christianity and, most recently, Calvin Theological Journal.